An article written with Dr Roy van den Brink-Budgen, Director at if…then ltd. This article is about Critical Thinking and Coaching. 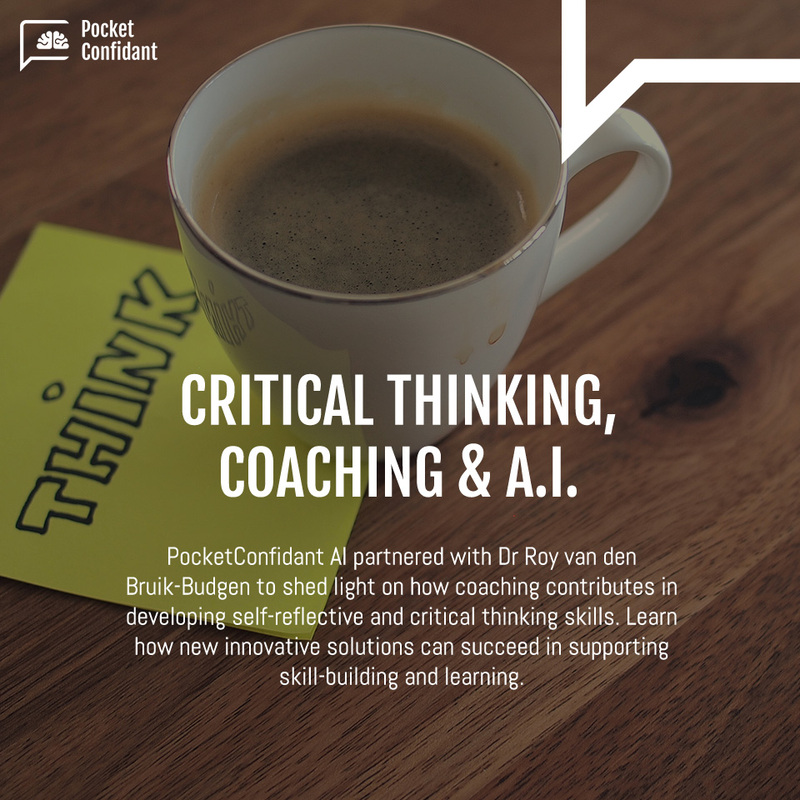 As PocketConfidant AI strives to build a technology to help individuals and organizations develop self-reflective skills, it seemed important for us to look at existing research and hear from a subject-matter expert to identify specific existing links between Critical Thinking and Coaching. Before reading, if you wonder how we define Coaching, you can refer to this article on What Is Coaching?, or this one on Can A Bot Be A Coach?. Though there are various definitions of critical thinking, they all include a focus on evaluation and reasoning. A recent example illustrates this: critical thinking is ‘a way of approaching and solving problems based on convincing, logical and rational arguments, which involve verifying, evaluating and choosing the right response for a given task and reasoned rejection of the alternative possibilities’ (Ticusan and Elena, 2015). The verbs used in this definition – approaching, solving, verifying, evaluating, choosing – emphasize that critical thinking is an active process, a process that uses skills to generate and evaluate possibilities, to reason for one thing rather than another based on careful judgement, and so on. Harvey Siegel expressed it very well: ‘A critical thinker…is one who is appropriately moved by reasons’ (p. 23, emphasis in original). In a nutshell, critical thinking can be described as ‘the activity of looking at the possible meaning and significance of claims’ (van den Brink-Budgen, p.1). It is this process of looking for and at significance that fits so well with the coaching method, with the latter’s emphasis on asking questions, considering possible answers, asking (and looking) for clarification, considering alternative approaches, adding in further information (and looking at how this affects significance), and seeking to produce a well-reasoned decision. This relationship between coaching and critical thinking can be looked at in more detail, both from a theoretical and from a practical perspective. In the first place, this relationship can be seen in terms of metacognition or ‘thinking about one’s thinking’. There are many studies that show the centrality of the importance of metacognition in high-level critical thinking. Some of these studies make a distinction between what is called ‘metacognitive knowledge’ and what is called ‘metacognitive regulation’ (for example, Brown, Flavell, and Davidson and Sternberg). Metacognitive knowledge includes knowledge of oneself as a thinker, of the characteristics of the task to be considered, and of the sort of strategies needed to achieve effective performance. Metacognitive regulation refers to the actual strategies applied to control cognitive processes, such as planning on how to deal with a task, monitoring understanding of it, and evaluating progress in dealing with the task. These two aspects of metacognition fit well with the coaching method, since this method uses both the coachee’s knowledge of themselves and the task to be considered, as well as using their initial plan on how to deal with an issue and needing the coachee to be part of the development towards clearer comprehension, through questioning and evaluation. The link between metacognition and critical thinking can be stressed by focusing on the evaluation of strategies in dealing with questions, issues, and problems. ‘Evaluating strategies involves the examination and correction of one’s cognitive processes. These include evaluating one’s reasoning, goals and conclusions as well as making revisions when necessary. In sum, a critical thinker is one who is in charge of his thinking processes, while metacognitive strategies enable such control to take place.’ (Ku and Ho, p. 252) The strong relationship between coaching, metacognition, and critical thinking can be seen from the above discussion. This analysis of the inter-relationship of coaching and the development (and reinforcement) of critical thinking is summed up well by Hatcher when he says ‘Critical thinking involves the honest evaluation of alternatives’. We can see how coaching and critical thinking fit together via the emphasis on questioning through dialogue, by dialogue on material and issues that are authentic to the coachee, by the tapping into and continued development of metacognition, and by the contribution to improving decision-making at all levels. At PocketConfidant AI, we focus on a technological approach that can provide individuals, whether they are students, employees, managers, staff, citizens or patients, with a solution to help develop critical life skills. We believe that Coaching is a great approach, that when delivered correctly – with neutrality, objectivity, benevolence and perseverance – can lead to great outcomes. We believe that we can build a technology that will be truly good for people, and help us address the challenges of today’s world such as stress, education for all, empowerment, self-confidence, and creativity. To conclude this article, we extend a warm thank you to Dr Roy van den Brink-Budgen for having produced this thorough and well-framed analysis. We and Roy would love to hear your comments and questions, so do not hesitate to contact us by email, or via Facebook, Twitter, Linked in, Medium or Quora. Abrami P et al, ‘Strategies for Teaching Students to Think Critically: A Meta-Analysis’, Review of Educational Research, Vol 85, 2, pp.275-314, 2015.
van den Brink-Budgen R, ‘Critical Thinking for Students’, How To Books, 2010 . Brown A, ‘Metacognition, executive control, self-regulation, and other more mysterious mechanisms’ in F. E. Weinert & R. H. Kluwe (Eds. ), Metacognition, motivation, and understanding (pp. 65-116). Hillsdale, New Jersey: Lawrence Erlbaum Associates, 1987. Catchings G, ‘A Practical Coaching Method for Critical Thinking Skill and Leadership Development (C/CTSLD)’, Management and Organizational Studies, Vol 2, 4, 2015, pp. 42-53. Flavell J, ‘Speculations about the nature and development of metacognition’ in F. E. Weinert & R. H. Kluwe (Eds. ), Metacognition, Motivation and Understanding (pp. 21-29). Hillside, New Jersey: Lawrence Erlbaum Associates, 1987. Grant A, ‘Teaching and conceptualising solution-focused coaching’, The Coaching Psychologist, Vol 7, 2, December 2011. Hammond J et al, ‘The Hidden Traps in Decision-Making’, Harvard Business Review, Sept-Oct 1998. Htacher D, ‘The Role of Personal Values in Argument Evaluation’, OSSA Conference Archive Paper 42, May 2003. Kahneman D et al, ‘Noise: How to overcome the high, hidden cost of inconsistent decision making’, Harvard Business Review, 2016. Ku, K and Ho I, ‘Metacognitive strategies that enhance critical thinking’, Metacognition and Learning, Vol 5, Issue 3, 2010, pp. 251-267. Siegel H, ‘Educating Reason: Rationality, Critical Thinking and Education’, Routledge, 1988. Ticusan M and Elena H (2015), ‘Critical Thinking in Development of Creativity’, International Conference of Scientific Papers, AFASES, Brasov.